The cops they aim at us, I don't mind if police brains splatter. Last week Officer Chickoree said not to bring our books. We'd meet briefly and then go to the Defensive Tactics Room for the ninth session on defensive tactics. So I didn't bring my notebook and wasn't able to write down Officer Chickoree's insightful statements about why police officers need training in defensive tactics and what it's all about. Nonetheless, it was an informative session. Officer Chickoree showed a video of some jujitsu matches with background music that included the quote above (or pretty close to it). This illustrates the types of things the public, especially young people, are exposed to these days. Many are desensitized to violence, including violence against the police. He also showed this video of the first use of a taser by a CMPD officer. (The taser was so new that other officers didn't try to apprehend the tased guy for fear of being electrocuted. They've been trained to know better now - once he's tased, grab him quick.) Some bad guys are hard to subdue! So, yes, for these and many other reasons, police officers need to learn defensive tactics. Office Chickoree also showed some videos of CMPD Training Academy classes. It looked like an ultimate fighting workout. CMPD has some of the best experts in martial arts anywhere. But it's interesting how big, athletic guys can get so tired and frustrated so quickly. We went to the multi-purpose room and then to the Defensive Tactics Room. We got to practice one-two punches and three-four dodges. I suspect actual CMPD recruits have to learn to count much higher than to four in their training, however. Like all Citizens Academy classes, it was about serious stuff, but it was also fun because we knew that people like us didn't have to deal with the types of things the real officers out on the streets had to deal with. "I'm like dust. I'll go where the wind takes me." I missed Session Ten a couple of weeks ago. Session Eleven last week was on Criminal Investigations. Officer Pam Zinkann of the Sexual Assault Unit was the featured speaker. The head of the unit, Sgt. Marsha Dearing, also helped out with the presentation. Officer Zinkann described described how the Investigative Services Group is divided into numerous units: Property Crimes, Youth Crimes, Homicide, etc. She described the criminal investigation process, which closely matches what's on police reality TV shows, except that real investigations aren't as quick as those on TV seem to be. She described a specific heinous case involving a home invasion and sexual assault against an elderly woman. As is typical, they photographed everything, up to 300 photographs, and took pads of paper worth of notes. They found a suspect, a 17 year old boy who frequently walked along the street where the incident occurred, but there was no evidence linking him to the crime. Much later an officer captured him after a break in attempt. He noticed the boy's hand was bleeding. They found blood at the scene, collected it for DNA testing, and were able to confirm him as the assailant. He rejected a plea deal for 45 years and wound up being sentenced to 135 years in prison. But one of the most interesting things that Officer Zinkann said was that the boy also was a victim. He was raised in a broken home by a single mother and had issues with his brother. However, he did know the difference between right and wrong and chose to do the wrong. 1) Gangs are bad news. They typically make their living through crime, although we're often told that most of the crime is against their neighbors, rival gangs, and people of the same nationality. 2) But even more scary is that gangs are very enticing to young people who have few options in life. The gangs provide the structure and support they don't get elsewhere. One of the most effective actions against gangs is to get to their prospective young members and redirect their focus to productive activities. Det. Nguyen was born in Vietnam and is very familiar with how young immigrants group together with other people who speak their language for help. Their parents often are working long hours to feed their families and can't provide the support they need to strive for a productive life. They wind up not having goals and just go where the wind takes them. I missed another session last week, so we're on to Session 13 - Resource and Activity Day. Unfortunately this session was scheduled on the same day as the ACC Football Championship, and several units were unavailable because their members would be busy keeping their eyes on Hokies and Seminoles later in the day. So we missed out on the Helicopter Unit, Bike Patrol, and Motorcycles. Nevertheless, there was lots to see today, and it was an interesting, instructive event - even though our first instruction was not to touch anything! The first presentation was by the Bomb Squad, which includes 10 Bomb Technicians from Charlotte-Mecklenburg Police and 2 from the Airport Police. They respond to about 30 calls a year in Mecklenburg and surrounding counties. About 10 of these involve actual explosives. Much of their time is spent in training, both in Charlotte and at other specialized training facilities, so they certainly know their business. When not responding to calls or in training, officers in the unit are on patrol or work in other specialized units. 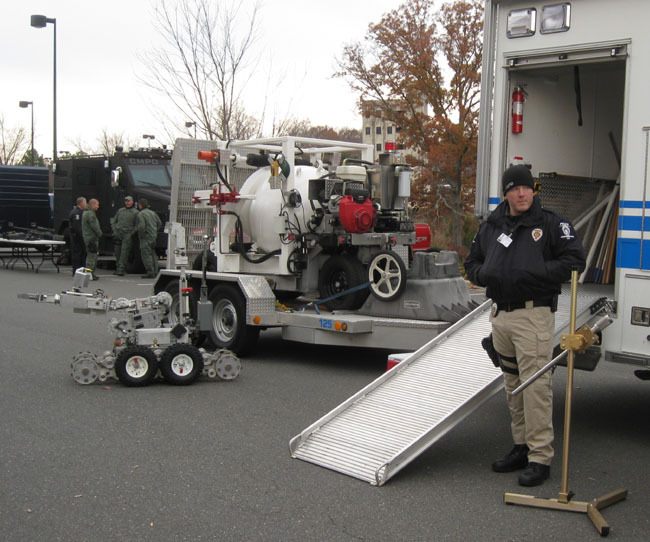 They showed some pretty impressive equipment, including their custom-made, $600,000 truck, their robot, their custom-made Total Containment Vessel (the round white thing in the picture below), an X-ray device, and other equipment. These are used to investigate suspicious packages and contain them, remove them, or disrupt them. 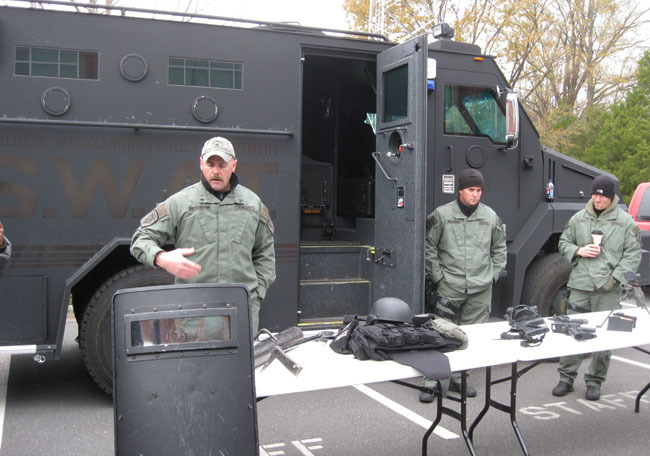 Most of this specialized equipment was paid for through federal grants for urban police departments. The second presentation was by Animal Care & Control staff. In addition to running the county animal shelter, staff enforce local ordinances regarding animal care and nuisance animals and operate Community Outreach Programs, including spay/neuter clinics, rabies clinics, and pet adoption events. There's a separate Animal Care & Control session in a couple of weeks, so more on that later. The third presentation was by an officer from the Canine Unit and his 85-lb German shepherd Nero. Nero is one of 13 dual purpose dogs in the Canine Unit. That means he's trained for patrol duties, including searches and suspect apprehension, as well as detection of various types of narcotics. The CMPD Vice and Narcotics Division also has three dogs trained in narcotics detection. Police dogs work hard, but they don't realize it. They think they're playing. If they start getting bored with their duties or have health issues, it's time to retire. Nero is 7-1/2 to 8 years old, which is the near the maximum age for police dogs. The final presentation was by SWAT tactical officers. Only one of the officers in the unit is assigned to SWAT full time. The others work regularly in other units. They respond to about 100 calls a year. Most are high-risk warrant service, but about 20 are hostage or other dangerous situations. The unit includes about 40 officers and sergeants. Several of those are trained as snipers, who apparently spend much of their time obsessively painting all their equipment camouflage. 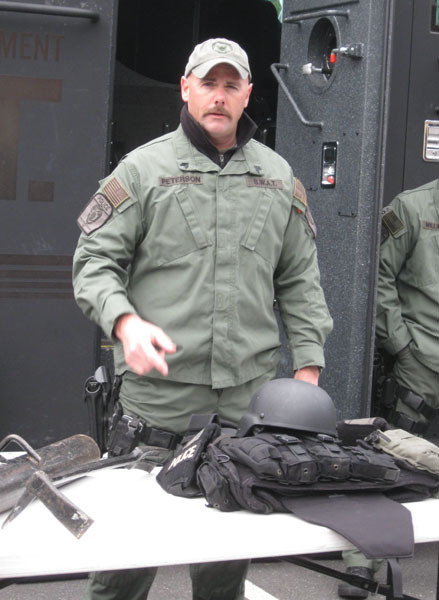 In the pictures below, SWAT Supervisor Eric Peterson displays protective equipment, including shields, protective vests, and helmets, and weapons. In the lower left corner of the second picture are two cameras, which can be thrown into an unsecure area to help evaluate what's going on. One is round, like a ball, and the other looks like a toilet paper roll with wheels. In the background is their new $300,000 armored vehicle. 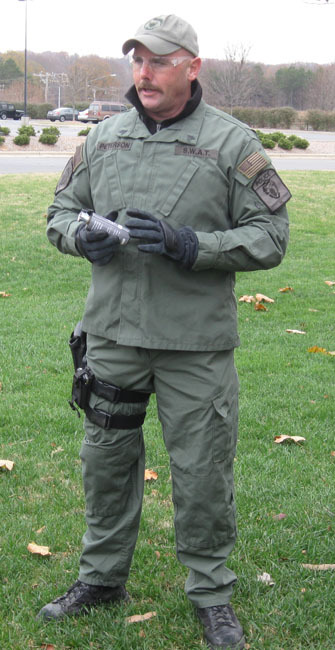 In the final picture, Sergeant Peterson is preparing to demonstrate a distraction device, which sounds and looks like a bomb blast and generates a shock wave. When he set it off, it was loud. Sergeant Peterson said that their experiences are nothing like we see on TV. If real officers fired as many rounds as TV officers do, they'd be unable to accomplish anything ever again because they'd be filling out paperwork forever. It didn't rain or snow, but it was cold. We look forward to being able to attend another Resource and Activity Day during the next set of Citizens Academy classes in the spring. I'm pleased to announce that I still have all my toes. As someone with no experience with firearms, I had some concern about the safety of my toes before tonight's session at the police firing range. But the instructors kept a close eye on us and made sure we only fired towards the targets. Sergeant Cullen Wright, Range Master at the Training Academy, was the main instructor. We got to stay in the heated shoot house while Sergeant Wright described how officers must qualify with firearms four times a year. We then watched him lead the current recruit class through a night qualification exercise. They had to shoot 50 rounds at distances from 3 to 15 feet in several short bursts while standing, kneeling, and holding a flashlight. They had to hit near the center of the target with at least 70% of their shots to qualify. If an officer or recruit fails to qualify, he or she cannot wear a police uniform or ride in a police vehicle. This means that they must strip down to whatever they're wearing that isn't police issue, which could be their underwear. This tends to motivate them to do better and qualify the next day. Sergeant Wright said that many recruits have no experience with firearms but often tend to perform better than experienced recreational shooters because they haven't developed bad habits. After the qualification, the Citizens Academy class got to go out in the 27 degree weather and take turns firing the .40 caliber Smith & Wesson M&P (military and police) pistols and the shotguns used by CMPD officers. I did pretty well for my first time. I hit all 12 rounds near the center of the target and didn't hit a single toe! Session 15 was on Crime Scene Search. Crime Scene Search Supervisor Lenora Barbour gave the class a tour of the Photo Lab, the evidence work room, the Biohazardous Room, and the Bay for Vehicles. She demonstrated the Panoscan system, which is a camera that rotates to take a 360 degree picture. This image can then be used to create a virtual tour of the scene. She showed a virtual tour of the scene featured in the Left to Burn/Trigger Happy episode of The First 48 TV show. She also demonstrated how Blue Star is used to detect blood on carpet, clothes, and vinyl flooring. The spray causes blood to glow in the dark! Finally she showed how evidence is marked with numbered tents for photographing and documenting before it's collected. At nighttime the little tents are placed over small lights that illuminate them for better photographing. Ms. Barbour said that she's typically the last person who can speak for a person who's been killed. It's her job to collect evidence in an unbiased manner so that both the victims and suspects are protected. She wants the evidence to identify the guilty but also clear the innocent. Session 16 was on Police Driving. Driving instructors Sergeant Tom Gwaltney and Officer Tommie Horton were the presenters. First, the non-driving stuff. Sergeant Gwaltney was standing in front of the group and said that if you can't get up in front of a group like this and talk, you'd have a difficult time being a police officer. Officers have to have good communication skills. From watching officers and other CMPD staff during these classes and ride-alongs, it's clear that most police staff love to talk and love to answer questions, especially about their jobs. Sergeant Gwaltney and Officer Horton in particular had a lot to say. The Citizens Academy class has been very grateful that Police Department staff have taken time to come out and tell us about the Department and give us the opportunity to see and experience things most people never get to. What's really interesting is that so many of the presenters have thanked us for coming out and taking an interest in what they do! Police Academy instructors do a lot of instructing but also spend a lot of time in training themselves. They keep their skills honed and keep up to date with the latest techniques and equipment. But back to driving. CMPD officers drive about 20,000,000 miles a year, and average about two and a half accidents per million miles. Somewhere around half of those were the officer's fault. Driving creates the greatest potential for injury or property damage for officers and the public - much more than firearms or other means. Driving accidents are the biggest liability for CMPD. It's Sergeant Gwaltney's and Officer Horton's job to make sure that CMPD officers are properly trained and prepared for driving police vehicles. 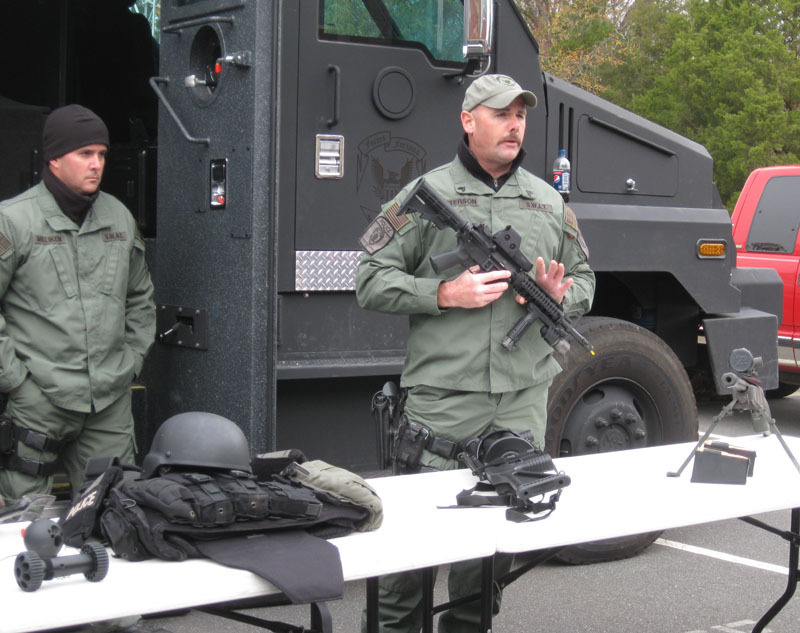 North Carolina Basic Law Enforcement Training requires 52 hours of driving training. CMPD officers get 72 hours. 1. Aim High in Steering: Keep an eye down the road. 2. Get the Big Picture: Know what's around you. 3. Keep Your Eyes Moving: Don't focus on just what's in front of you. 4. Leave Yourself an Out: In case something happens, make sure you have space available to avoid it. 5. Make Sure They See You: Seek eye contact and use warning devices. Officer Horton said that a police car is a patrol officer's office. He or she spends six to eight hours a day sitting in the car. A basic part of the instruction is how to sit in the car. Many officers slouch or sit twisted, and many wind up with back problems later in life. Hands should be on the steering wheel at 3:00 and 9:00. This gives good control, and if the air bag deploys and you have a big wrist watch on, it won't imprint the wrist watch into your forehead. The class asked about police officers that exceed the speed limit during routine driving. When I was on a ride-along, the officer passed a 35 MPH sign going 45. I asked him about this and he mumbled something about how much training they get and that he would never get to all the places he needed o go if he always went the speed limit. Sergeant Gwaltney rolled his eyes. If a police officer goes over the speed limit, he is supposed to have his blue lights and siren on. While there is no speed limit for police officers with blue lights and sirens going, North Carolina law requires them to drive with due regard for the safety of others. A class member said that during her ride-along, the officer never put on his seat belt. I had ride-alongs with three officers. One wore his seat belt some of the time. I don't think the other two wore theirs at all. Just for the record, Sergeant Gwaltney thinks you're idiots. They showed a video taken by an officer's dash cam. She was speeding down Central Avenue to a call, sometimes at a very high rate of speed and mostly without her blue lights and siren on, which is highly against the rules. It turns out she was confused and going to the wrong place. From the right lane, she decided to make a U turn. Unfortunately her Adrenalin and tunnel vision prevented her from noticing that there was a car passing in the left lane. That car's fender wound up with a nice dent and police car paint on it. The officer wound up in remedial training. This was a demonstration of what not to do. Ultimately it's the instructors' responsibility to prepare the officers for police driving. CMPD goes well beyond what they have to do to teach officers what they shouldn't do. They teach officers to drive at 80% of their ability to leave room for error. But enough of the classroom talking -- let's get out to the driving range. Charlotte operates a Driver Training Facility in 16 acres across from the Police Academy. In addition to the Police Department, the Fire Department, CATS, utilities, and other departments use it for training. It includes a variety of street layouts and a 100' by 250' wet pad. Officer Horton set up two courses. One was a precision course that required going back and forth and in and around different simulated obstacles, driveways, and turnarounds. It required 21 gear shift changes between forward and reverse. The other was a slalom course that required driving it once forwards and once in reverse. Each was about 300 to 350 feet long. The plan was for the class members to drive police cars on the courses, but instead, Officer Horton was asked to demonstrate the precision course. He then was asked to demonstrate at full speed. We took turns riding on each of the courses with Officer Horton or Sergeant Gwaltney. They ran them at full blast at a speed that us mortals could only imagine. They quickly switched from forward to reverse (always looking through the back window) and turned and beeped their horns (actually required before starting in reverse) while all the while holding a normal conversation with us passengers and knocking down only one traffic cone. To qualify, officers have to run the precision course in 2 minutes. Officer Horton did it in about 1:07. We then watched a simulated pursuit, with Sergeant Gwaltney chasing Officer Horton. They raced all over the facility at speeds that would impress Hollywood. We experienced and saw demonstrations of driving skills that most people never see. We also learned that Officer Horton won a national police driving competition a few years back. Most police cars are driven from 110,000 to 130,000 miles before they're retired. The cars used for driving training last for about 3,000 miles before they wear out. That's a good indicator of how intense the training is. The last CMPD Citizens Academy class was on Animal Care and Control (AC&C).Presenters were Mark Balestra, AC&C Director, Melissa Knicely, with AC&C Public relations, and Julia Conner, with the Humane Education Program. Officer Knicely was at the Resource Activity Day a few weeks back. She had so much to say that I couldn't keep track of it all. I planned to wait for this session to catch all the things they do, but it was hard to keep up. These are busy folks. Charlotte Animal Control was established in 1944. It came under the Charlotte Police Department in 1993, one year before the city and county police departments merged. They operate out of a 45,00 square foot facility on Byrum Drive, on the northern edge of Steele Creek. They have a $5 million annual budget and are one of the largest animal control departments in the southeast. They work closely with the Humane Society of Charlotte, animal rescue organizations, and other partners. Much of the work is done by 250 to 275 volunteers. As the presenters stressed, there are numerous volunteer opportunities and more volunteers are always welcome. See Volunteer Services. The two major functions of SC&C are to operate the Animal Shelter and enforce Local Ordinances. The shelter houses an average of about 360 animals at any given time. Most of these are dogs and cats, but they also have rabbits, lizards, birds, fish, hamsters, one llama, several horses, and a couple of goats. The goats actually are there to provide practice for a dog in another local agency who is a trained herder. He's available to help round up loose livestock around the county and comes out to practice on the goats from time to time. They strive hard to find homes for all adoptable animals. The unfortunate part of Animal Control is that they can't find homes for all of them. They find homes for most adoptable dogs, but 86% of the cats they take in never leave. The cat population in Mecklenburg County is out of control. There are several feral cat colonies and many stray cats throughout Mecklenburg County. AC&C strives to reduce euthanasia through several community outreach programs. Their highest efforts are directed towards sterilization. They operate regular sterilization clinics that are funded through the Humane Society or other donors. They also promote adoptions at their facility and through adoption fairs, such as a regular one on the first Saturday of each month at South Park Mall. 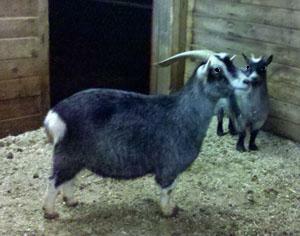 All animals available for adoption are pictured and described on their web site. They encourage folks to adopt animals through AC&C or the Humane Society rather than a pet store. The most common dog breed in Mecklenburg County is the pit bull. These can be aggressive and are popular with dog fighters, which do exist in Mecklenburg County, but can also make good pets if trained and treated properly. they had one plump, slow pit bull named Piglet wandering around the facility that Mr. Balestra described as a coffee table that walked. Among the newest outreach programs is the Pet Food Bank, operated by AC&C in partnership with Second Harvest Food Bank. Recently, many folks have had trouble affording to feed their pets and have been turning them in to AC&C. The Pet Food Bank provides them with the support they need to keep their pets at home and out of the shelter. AC&C offers microchip clinics. Animal control officers carry scanners that they can use to easily and quickly identify lost pets that have microchips and return them to their owners. The Field Services Section enforces local ordinances, including a recent one concerning tethered dogs. Dogs often are tethered near the front of a building as a theft deterrent. These dogs generally don't receive the attention normal pets do and tend to become bored and aggressive. AC&C operates an Emergency Response Unit, which is equipped to house up to 100 pets forced out of their homes by a fire or other disasters. They also offer regular rabies clinics. Rabies is a cruel disease and all pets need to be properly vaccinated. Officer Julia Conner talked about Humane Education programs and instructed us on Bite Prevention. Her assistant, trained therapy dog Ebony wasn't impressed and spent her time visiting with the folks in the class. I took more notes at this session than any of the others. there is a lot going on at AC&C, and staff such as Officers Knicely and Conner are always looking for more opportunities to serve the animal population of Mecklenburg County and their owners. -Research, Planning, and Technology - This includes coverage of crime mapping tools available to the public and real time information available to officers. Since maps is what I do, this is of special interest to me. Unless I have other conflicts, I plan to attend these sessions next spring and complete the course requirements. Stay tuned. I'll post information on these sessions as I attend them. If you're reading this and taking the Citizens Academy classes, please register and share your thoughts! I don't remember the context of this statement, but I thought it was a pretty good expression of what officers' have to face each day. It's a tough game to play when only one side has to follow the rules. They have to be prepared for anything. The spring classes for the Citizens Academy began a couple of weeks ago and I started back to pick up the classes I missed. This week was Recruiting and Training. Recruiting Director Captain Gerald Smith said he had the most important job in the Police Department. He is responsible for recruiting and selecting new officers and for giving them a gun and a badge and the power that comes with them. The department used to pick from whoever came through the door, but Chief Monroe has placed an increased emphasis on recruiting. Now they actively recruit in CMS, in area colleges (including women's sports teams), from the military, and wherever else they can go to find good candidates. They actively recruit women, Asians, Hispanics, and African Americans so that the department will better represent the community and be better able to deal with the diversity it encounters in the community. The application process is long and tedious. In addition to the standard city job application, applicants must respond to an additional 17 pages of questions that ask everything from employment history to activities on social network sites. They have to provide copies of virtually every legal document they have. They also have to pass tests that measure short term memory (viewing a photograph for two minutes and answering questions about it), reading comprehension, and writing skills. Officers spend a lot of time writing reports and must be able to write complete, understandable reports. They also have to pass a physical abilities test, which includes running and doing a number sit ups and push ups within a set time, but this part is under review. Rather than speed and strength, the department is moving towards an emphasis on cross training and cardio, which better demonstrates an ability to chase and handcuff a guy. They also have a background interview, psychological exam, polygraph test, background checks, behavioral interview, physical exam, and drug screening. If they get through all that, their application has to be reviewed and approved up the chain from the sergeant to deputy chief levels, plus the city civil service board and the state. All this can take from 2 to 3 months, but it provides a good means to judge applicants and choose those who best meet the needs of the department and the community. The process helps ensure a low attrition rate through training, which is at about 10%. Once selected, they're advised on getting prepared for the challenges they'll encounter in the academy, including physical fitness training, long classroom hours, and less time for their families and social life. The department did make a major error a few years ago when they overlooked background information that would have eliminated Marcus Johnson from consideration, but under Chief Monroe, the checks and screening are more thorough and reliable. After Captain Smith spoke, Training Director Captain Jimmy Fields and Sergeant Tom Gwaltney gave a tour of the academy. There are several rooms with computers set up as the Backup Dispatching Center and Backup Command Center. In the event of a major disaster that disrupts centers uptown, they can rely on a generator to provide power manage emergency services county-wide from these rooms. We saw the fitness and physical training rooms and got to watch a demonstration in a class on handcuffing techniques. The state requires a 16 week basic law enforcement training for police officers, but the Charlotte-Mecklenburg training is 23 weeks. They don't teach from the boxed curriculum in the state requirements that's based on hours spent in class but strive to teach concepts and make sure the trainees master these concepts. In North Carolina, only Charlotte, Greensboro, Raleigh, and the Highway Patrol have their own training academies. Training for other police departments is done through community colleges. Many of the instructors in the Police Academy are specialists from various units from throughout the department, and many of them also are instructors in the Citizens Academy classes. Their knowledge, skills, and enthusiasm are evident. The Charlotte-Mecklenburg Police Academy provides quality training that focuses on the needs and issues facing the Charlotte-Mecklenburg community.